Includes a 200W motor and 2mm oscillation. MILWAUKEE has launched three premium quality sanders to its heavy duty range of power tools. The sanders are built with die-cast aluminium gear cases, underlining the Milwaukee Heavy Duty trademark. They are covered by the ‘Nothing But Heavy Duty’ two year warranty. The POS 13 is a palm sander that has a dual paper system, either Velcro or standard paper that uses clamps. The POS 13 is the best choice for sanding flat surfaces and along straight recessed edges (door frames and work tops). It is a delta sander that will reach comfortably into difficult areas such as corners and louvres. 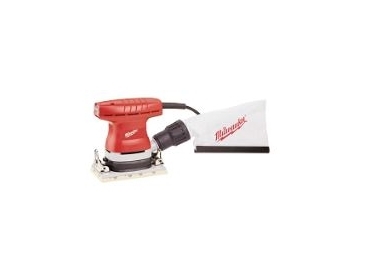 The PRS 125E is a variable speed random orbital sander with a pad brake and an additional centre extraction hole to improve dust clearance and reduce 'caking'. It is the surface specialist, the eccentric motion gives the best quality finish and a faster stock removal. The metal gear case and top quality bearings of the Milwaukee sander range ensure best durability even with a constant oscillation rate as high as 26,000rpm throughout the lifetime of the tool. All three models have 200W motors and 2mm oscillations. An advanced fan design creates effective dust extraction through the special ventilated base pad that collects the dust not only through the underside of the base, but also the side, and with the PRS 125E, around the circumference of the pad. The 35mm universal dust extraction nozzle enables use with either the dust bag supplied or for connection to a dust extraction system, such as the Milwaukee ASE1400. All three models are supplied with a 4m heavy duty cable, enabling freedom of movement around the workplace. At only 1.3kg each, the ergonomic designs of the Milwaukee sanders make them comfortable, manouverable and efficient.